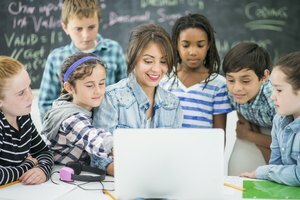 Are Computers Overused in Elementary Education? Computers have been shown to help students learn -- at a certain age. Back in 1985, a team of University of Michigan researchers published an article in the first volume of Computers in Human Behavior called The Effectiveness of Computer-Based Education in Elementary Schools. The team found that programs that included computer-assisted instruction saw student achievement increase from the 50th to the 68th percentile. But in the years since, as computers have become ubiquitous in schools, other experts have debated their use in classrooms. A researcher at the University of Sao Paolo in Brazil has drawn up a summary of the general arguments for having computers in elementary school classrooms. The general sense among experts is that computers “should be learned and used as soon as possible” and that computers are good tools for learning. Computer learning is said to enhance imagination and visual learning and to stimulate learning (a point that is contested by opponents of digital learning environments). 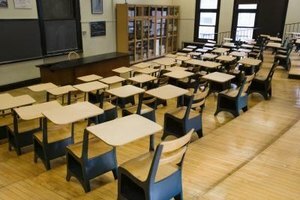 In the same study, the Brazilian researcher explains some of the arguments against computers in classrooms, including an increased reliance on technology, which can create a sense of dependency that can lean to children feeling out of touch with their classmates. As with any academic skill, struggling with learning computers can lead to a sense of isolation; when a computer becomes the means to learning and a child can’t understand how to use it, that child’s education is hampered by technology. Technical literacy becomes synonymous with basic literacy, and not knowing how to use a computer is akin to not knowing how to read. In 2011, author and psychologist Dr. Aric Sigman came out strongly in opposition of using computers in classrooms. Sigman argued that exposure to a computer before the age of 9 could severely stunt a child’s ability to pay attention, as computers require multitasking that cannot be learned at the same time. Sigman still believes that learning from technology is important and helpful, but that students are learning from screens too early and that the prevalence of computer-assisted teaching can slow down natural brain growth. There are still a few places in the world where computers in classrooms are not a standard feature, allowing researchers the chance to trace the effect of computers on studying in real time. Chinese researchers found that by introducing computers into classrooms in poor, rural communities, students studying math and Chinese -- the only two subjects examined by the report -- experienced notable improvement in academics with the introduction of computers to their learning. In these areas, computers were still considered underused in classrooms. Aarons, Andrew. "Are Computers Overused in Elementary Education?" Synonym, https://classroom.synonym.com/computers-overused-elementary-education-15099.html. 26 September 2017.